Search engine optimizing, or SEO sort is nothing more or less than making your page friendly for search engines like Google, Bing or Yahoo. 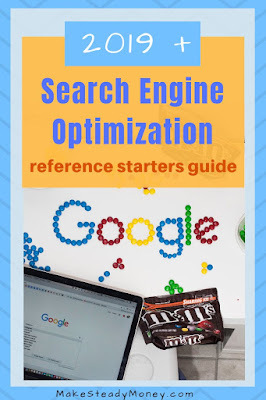 When someone searches for specific info that your site provides, good Search Engines Optimizing will show your page or blog in a higher position at the search results. The best traffic or visitors you can get comes from direct searchings in search engines (organic search). This traffic is free and targeted and people are willing to read info where they have searched for themselves. Writing content is completely useless as no one can find it. 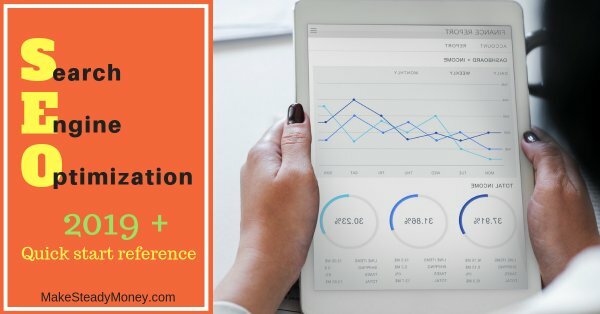 Here you will find the used terminology, tricks, do's and don't that you can do by yourself to make your site rank up higher in search engines. To start off with a little disappointing…. The day’s of just set and forget SEO are long gone now. Optimizing your page with keywords and titles are just the simple basics and serves only as a driving force for your first hits in the modern search algorithms. If people leave your site quickly with no interaction, your site will be rated down in the search engine algorithms fast. 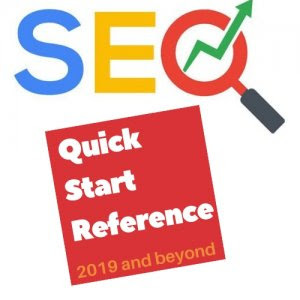 Search engines look heavy at interaction with your page by users and your post frequency in 2019 and beyond. A high ranking will take time also, don't expect a direct page 1 search result position after you progressed your SEO steps. A blog or site needs time to grow, and fresh content postings on a regular base. gives you some time because you have worked ahead. Don't release all your content at once but spread it on a regular base, like weekly, every two days, or 5 times a day, depending on your blog niche and time. The so-called outside page SEO like, quality backlinks, social appearance (and likes, thumbs or clicks from it), surf time and internal clicks are the things that make the difference, good search engine optimizing will take constant work over a long period of time. Inside post SEO are the things you can do inside your article post to optimize it. Inside SEO is essential, every serious blogger spends time on it. Without proper inside SEO, your page won't be found at all and you will not have a chance to create an acceptable visitors base. There is a lot check and keep in mind about inside page SEO while creating or writing a blog. The very first thing to do is getting a real domain name like .com or a land code extension (.nl, .uk, .au) these will cost you online about $ 12.00 - $ 16.00 a year at NameCheap or Godaddy. I mean, Did you ever see a BlaBla.blogger.com or a BlaBla.wordpress.com high inside search engine rankings? You can find a lot of good free or one-time payment SEO optimized templates online by searching for "Seo optimized blogger (or WordPress) templates free" or even an AMP and Seo optimized template. Keep it simple and user-friendly, don’t let people get lost in hard to find menu’s etc. in nine of the ten causes a top header/footer and sidebar will do the job. The topbar header and sidebar will be the same in all your pages and this can contain, menu, info about yourself, menu, highlighted articles, (commercial) banners, contact form or pieces of a script which you want to appear in all your pages. To decrease page load time, use scripts in the footer, in this way your content will be there first and the scripts ”tricks” afterward. Clean text links will index the best in search engines. Do everything in your power to make people stay and click to other articles inside your blog. People read the most entertainment posting on there smartphones or tablets. Creating responsive mobile friendly pages is absolutely essential. A “bounce” is when people enter your page and leave in a short period of time without any interaction in your site (click, scroll, etc). Search engines love low bounce rates and pages with high interaction will scale in their algorithms fast. The Page and Post terms inside Blogger, WordPress or Tumblr can be a bit confusing because they look the same but they are definitely not! A page is a site in itself and will always be in the same place but has lower SEO configuration possibilities than a post. In a page, you can set the page title and description only. The timestamp of a page is locked and can't be changed. A page is best used for longer, evergreen content. and the "end goal" where you want to redirect your visitors to. Pages will/can be linked to your menu widget. A post will be placed on your blogroll at your homepage with the latest post at the top, like the timeline of Facebook. 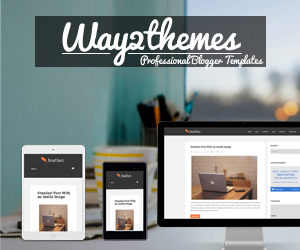 A blogger post has no description but a title, editable timestamp, location tag and labels. Posting will be found easier in search engines than pages. The title of the post is a clickable link to display that post separately from the blogroll as a stand-alone post. A post is best used as an intro to a page or an article. Most of the time I use a page for my main (evergreen) content in newspaper style (Headline - Bold intro - Content). Over time, I can create one or more postings with inline links to my main page article. In this way, I can easily reuse my main evergreen content by writing a teaser, update or trend related postings. If people click on an internal inline text link, from my post to my page, I have generated an interaction that provides me with a lower bounce rate. Kristine Schachinger wrote a perfect checklist on how to write optimized title tags in her original post, so I’m copying it for you here, with a few minor updates: Length: Title tags should be 50-60 characters long, including spaces. Do not ‘keyword stuff’ title tags: these are badly written title tags that try to rank for everything or repeat a word over and over. Keyword stuffing is the worst offense when it comes to title tags and you will be penalized for it. ANYTHING review | Scam or legit? The page description is the little text you see in the search results below your title. This should be catchy as an intro to your article and has your most prominent keywords in a little story. Page description can be up to 160 characters. Keywords in the keywords section are heavily overrated and low weighted by search engines, very old school, some hashtags at the bottom are a new way. Use social media friendly image sizes, you want good looking clickable links on social media sites. Social media will take the link picture from your blog site when your post got shared. Always name your pictures, tables etc with the alt tag attribute, shortly and with a keyword, don’t clutter up keywords or use long alt tags. Google uses this for his image indexing. Some examples are “free success arrow”, “money from home chart”. It might be a good idea to watermark all your images also. When people use your images inside their own projects, your web page is printed in it. Providing you a long-term, endless, promotion display. OpenGraph (OG Tags) were originally introduced by Facebook in 2010 and, later on, adapted by Google +, Pinterest, Twitter. with the goal to step up how your site will appear in social media when visitors like or share it. In the example below, Open Graph will tell Facebook which Image, title and description to use when the page is shared. A snippet is how Google shows the search results to the user. For example: If you were googling "DIY Coffee". Google shows you a list with normal snippets and rich snippets. The big might is that there is no guarantee that Google will display the search results to your page like this. Sometimes Google will display your snippets for a long period, a short period or not at all. This depends on many (for me) unknown factors. This where the real winner work starts, Outside page SEO is everything you can do to promote your article/blog to rank up inside search engines. See your blog as a center of a mini web where you link to from as many as possible GOOD sources. 1. “Forced views”. These are views where you just pop your blog in front of people that didn’t choose to go to your blog. By this, I mean direct hits from Paid to Click sites, Whitelist mailers, pop-under advertising, Traffic exchangers and the very worst bot traffic from auto-surf programs (No matter what they promise, never, ever use auto-surf). 4. Buying facebook likes, comments etc. These come from spamming empty social accounts mostly, Users will report this accounts as spam and the social platform moderator will remove that empty social account in a short period of time, making your likes to count down and search engines will notice that. These are things where I am not sure about or fall in the grey area of good SEO. it’s smart to avoid directly to your blog promotion placements on low quality or low trust sites. With this, I mean buying of cheap traffic, banners in paid to click sites, whitelist mailers or traffic exchanges. It’s true that a banner click or text ad is a person who wants to see your site but search engines “know” that this came from a low appreciated site and will measure this in their algorithms. Search engines are highly artificial intelligence and it good to keep in mind from where you send your visitors to your blog. The very best way to promote in low-quality traffic sites is by using a "capture lead page" as the target from your banner or splash pages. Give people a reason to fill their e-mail address, like a big promise or give away, inside that capture lead page. This will build you a "list" of people that you can mail about your new, old or updated articles, by using an autoresponder. Alternatively, You can use an "in between page" with intro text and images of your most catchy posting on a different free hosting platform like Blogger, Wordpress or Google sites. In that way, you click to your blog will come from a free blog and not from a low-quality traffic site. 2. Create Social media postings with a link to your blog, likes, shares, thumbs, hearts will help a lot. Just spread your site in a many as high-quality pages that have interaction as possible. Tip. Google loves google the most, Google+ and Youtube is a must to post links to your site. The other big ones like Facebook, Twitter, linked in, Instagram. Pinterest etc. will help enormously also. The more interaction the better but beware that you don’t get lost in social media. It’s better to maintain 2 different accounts than 10 not. Also, different social media sites have different aprocing. Pinterest can be used as a visual search engine and will give you a boost when you set up keywords and descriptions into your boards and pins. 4. Always fill in your profile or social sites when programs have a special section for this, with a link to your blog of course. read my article "How to write a smashing public marketer profile"
5. Posting in well known (local) second-hand sites and magazines like ebay.com, craigslist.com, marktplaats.nl, 2dehands.be in sort, try to get your link to anything that has a high Google PageRank. 7. Fish for post comment, thumbs etc. If you are working in a team building group, ask the members to read your new post and comment on it. When you have done everything you can do for yourself, you can always rent a professional worker for an affordable price at Seoclerks or Fiverr'. Please always check the reputation of the worker in this cause. All of this might seems like a lot to think off and hard to do. The most important thing that you need to keep in mind is that after you wrote an article, you spend some time to set up the inner page SEO directly afterward. This need to go inside your system and is just as important as writing the article itself. This checklist can be used to do your outside page SEO step by step over time to keep your search indexing optimized. Feel free to ask all your questions, place your comments or extra tips in the comment section below.